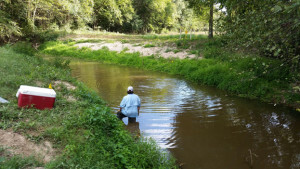 BIO-WEST conducted mussel surveys along approximately 16 miles of a proposed 42-inch natural gas pipeline alignment in Panola County, Texas. Tactile mussel surveys were conducted by qualified biologists at 11 perennial stream crossings to determine presence or absence of state-listed mussels of conservation concern. Tactile surveys or “brailing” consisted of manually feeling the substrate for the presence of mussels either directly on the surface or a few inches below the surface. These surveys were conducted along four 1-meter-wide transects at each stream crossing. In deeper waters snorkel and/or scuba equipment was used to search for mussels. Survey transects were strategically placed to account for presence/absence of mussels within the pipeline right-of-way, along with areas of potential impacts related to construction (i.e., the actual footprint of excavation along with downstream areas potentially impacted by sedimentation or siltation). Survey transects were placed approximately 30 feet upstream and downstream of the right-of-way centerline, with one transect directly at the centerline and one 15 feet downstream. Mussel species listed by the Texas Parks and Wildlife Department that may occur within Panola County included the Texas pigtoe (Fusconaia askewi), sandbank pocketbook (Lampsilis satura), southern hickorynut (Obovaria jacksoniana), and Louisiana pigtoe (Pleurobema riddellii). 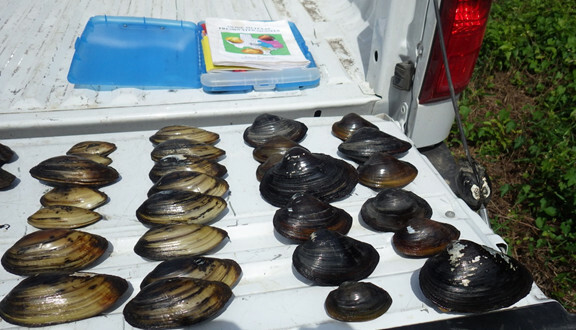 Surveys were conducted under BIO-WEST’s Scientific Collection Permit authorizing the survey of mussels listed by the Texas Parks and Wildlife Department as threatened.